This Baltimore & New York office car seen on the tail of a scheduled passenger train has the company brass on board. It's on its way to inspect another Division farther west. The office car is a modified Walthers 'executive observation' kit from the 1950s. It was 'back-dated' with truss rods, to model an older car having a steel underfame and a wood body that was sheathed in steel. It also has full interior with passengers and personnel aboard as well as complete underbody details. The marker and track inspection lights are powered by hidden batteries (under the beds in both staterooms) and a switch hidden in the water tank under the car. This makes them independent of track power. The C&O sleeper ahead of it was built from an American Standard styrene kit in the 1980s. Nice car. Is it "O" or "HO"
What did you use for the canopy? I've been looking for that effect on another project. Nothing I have tried thus far looks as nice as that. Almost looks like blue painters tape. 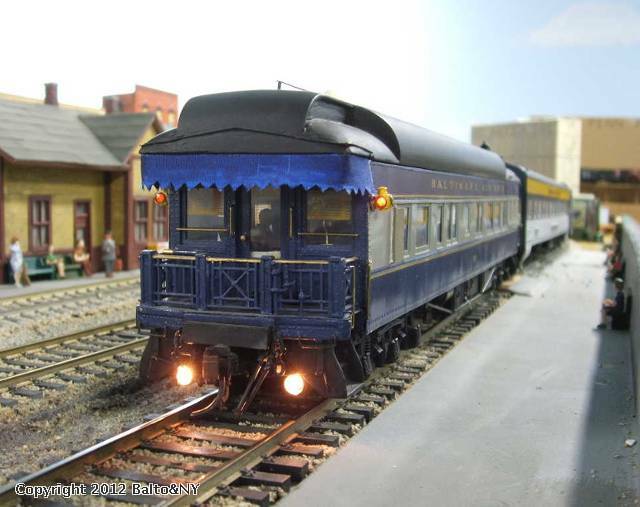 The car is O scale 2 rail and rolls on sprung 6 wheel Pullman type 2010 trucks. They were originally made by Grace Line in the 1940s and are still made by Keil Line. The platform awning was made from plain, dark blue dress material cut with pinking shears for the lower edge. All cut edges were treated with a fabric edge stabilizer to keep them from fraying. Found in fabric shops it's something like Krazy Glue but dries perfectly clear, leaving no stain or shine on the fabric. On a prototype awning, there would be metal tubing supporting the lower edge of the canvas awning from behind, just above the zig-zag cut. Prototype awnings could be raised (the outer end only, raised up to the roof) or lowered slightly. This one is shown lowered. That fancy cut was also purposeful. It enabled water from rain to drain off more completely from the awning and hasten drying. That's a really nice job on the canopy. I've tried cloth, but it appears too bulky on my project.